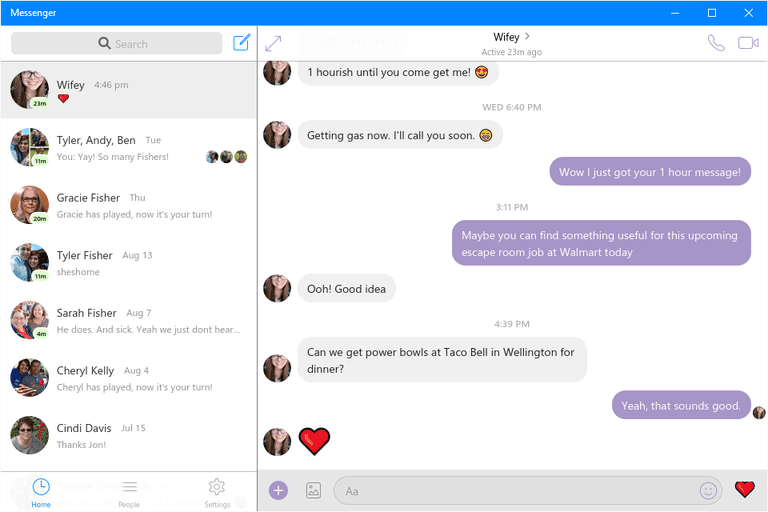 You can download Facebook Messenger for your Windows desktop computer if you have Windows 10. You can start new conversations, open old messages, and make phone calls and video calls. The desktop version of Messenger is a lot like the web version in that you can search through your messages and share things like GIFs, images, documents, Emoji, stickers, videos, and other files. However, you can't play Facebook games, create reminders, or send money like you can through Messenger.com. There used to be a desktop client for Facebook Messenger that would run on other operating systems, but according to Facebook, Messenger is currently only available for Windows 10 users. See the section at the bottom of this page for some alternative Messenger programs that will work with your computer. To get Facebook Messenger on your desktop, access the Windows Store to download the app. Visit the Messenger download page. Click Get in Microsoft Store. When the Messenger download page shows that the program is finished installing, click Launch. Like we mentioned above, you can download Messenger for Windows 10 only. If you use a different operating system, your only options are to use Messenger in your web browser or download a third-party, unofficial program. Windows, Linux, and Mac users can install Messenger for Desktop. Another option for macOS is Messenger for Mac. A second Messenger app for Windows is much more like the web version but can be installed on your computer or run as a portable program. It supports themes, can hide "seen" messages, can suppress the typing indicator, supports sending money, and lets you view archived threads and see message requests. Regardless of your OS, you can use Messenger in its full form through Messenger.com, which is the official website for Facebook Messenger. To use Messenger on your mobile device, install the Android or iOS app.